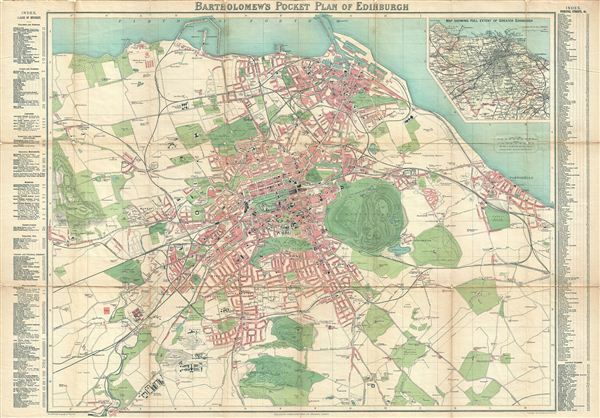 Bartholomew's Pocket Map of Edinburgh. In the previous century edinburgh was the heart of the Scottish Enlightenment. Celebrities from across the continent would be seen in the city streets, among them famous Scots such as David Hume, Walter Scott, Robert Adam, David Wilkie, Robert Burns, James Hutton and Adam Smith. Edinburgh became a major cultural center, earning it the nickname Athens of the North because of the Greco-Roman style of the New Town's architecture, as well as the rise of the Scottish intellectual elite who were increasingly leading both Scottish and European intellectual thought. During the 19th century, Edinburgh, like most of Scotland, benefited enormously from the Industrial Revolution. Good. Some wear and slight loss on original fold lines - see image. Backed with linen.